Editor Susanna Wright offers this updated edition of a Christian devotional classic—invoking the daily prayers and timeless imagery of the original text through modern, accessible language. In this wonderful collection, famed theologian Dr. John Baillie shares personal prayers for people who are seeking a better understanding of God and themselves. Organized by morning and evening—with special prayers for Sundays—A Diary of Private Prayer is written with eloquence, piety, and directness. Blending praise and meditative thoughts about God with a concern for the social and individual good, these daily invocations help and inspire us to search our inner selves and find the deep religious beliefs that lie within. First published in 1936, A Diary of Private Prayer remains a seminal Christian devotional with more than a million copies in print. This modern edition—completely redesigned into a gift package—admirably preserves all the qualities of the original, ensuring that the wisdom of God and the wonder of Baillie’s prayers remain accessible for many generations to come. John Baillie was a teacher, lecturer, preacher, and author of many books, including Christian Devotion, The Place of Jesus Christ in Modern Christianity, and A Diary of Readings. He held academic posts in the UK, the US, and Canada; was Moderator of the General Assembly of the Church of Scotland; and President of the World Council of Churches. He died in 1960. 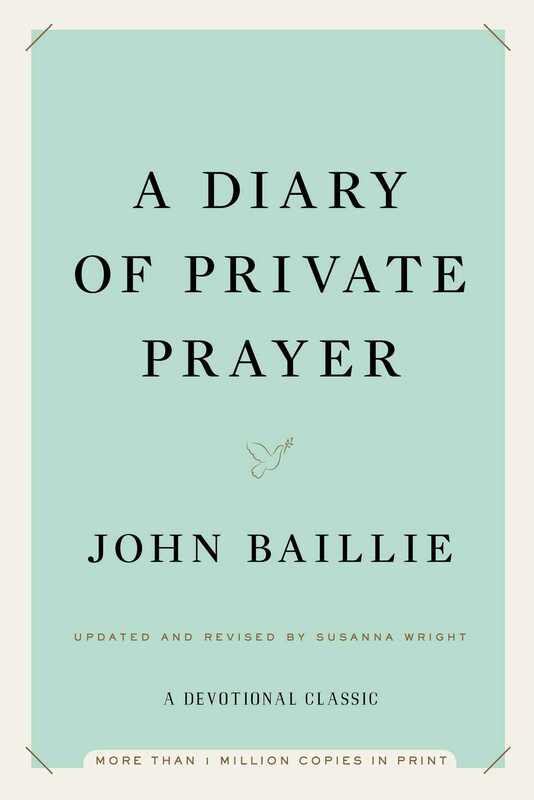 "This new edition of John Baillie's classic is a wonderful resource for anyone wishing to go deeper in their prayer life. The beauty of language, depth of meaning and scope of subject is extraordinary. I recommend this new edition to all who wish to see their daily prayer life expanded and blessed." "Prayer is the language of faith. Like any other language, the best way to learn it is to listen to native speakers and practice. In this book, the beginner will find ideas, words and patterns that will help to guide and grow their own prayer life; and those who have been praying for longer will find fresh inspiration. But most importantly, all who use this book will draw closer to the God who came to speak to us in our language so that we may learn his." "The Diary of Private Prayer by John Baillie sold over a million copies and blessed many Christians over the last century. This contemporary version will open it up to a new generation and will be a great aid to prayer for those starting out on their prayer lives as well as to long standing Christians." "Since its initial publication in 1936, The Diary of Private Prayer has become established as a modern spiritual classic. Now translated into several languages, it has become the best-selling work of any Scottish theologian. The Diary's breadth of subject matter, felicity of language, and simple piety have impressed its many readers at different times and in diverse circumstances. This updated edition admirably preserves all these qualities while ensuring that John Baillie's Diary will continue to be accessible to another generation." "A fresh and helpful answer to the perennial cry of humanity, 'Teach us to pray."